In celebration of Halloween I’ve written an article for the Seymour Duncan blog about an eeeevil-sounding scale I came up with. I like to use this to pretend I’m Black Sabbath. You can hear a demo track composed with this scale below, but be sure to read the full article to learn the scale for yourself and to take in the different elements it’s composed of. I recorded this track using my Buddy Blaze Sevenator prototype with Seymour Duncan Full Shred and ’59 humbuckers through my Marshall DSL-50 and an AxeTrak isolated speaker cabinet. I love my JLH Products AxeTrak. I use it for recording and reamping all the time and it sounds amazing. It allows me to crank my Marshall up to boiling point and record the results without getting evicted. Well check out this new upgrade to the AxeTrak. I think I might have to get me aother one! This new version has all the features of the previous model plus one huge improvement. This model lets you adjust the microphone placement. That’s right; by simply turning a simple thumbscrew located on the top of the unit the user can alter the position and angle of the internal microphone. This added feature gives the user unlimited sound options and total control as to how they wish to record or mic their setup. We took our users suggestions seriously!!! From nice clean sparkly tones (on axis), to darker (off axis) tones, this unit does it all. 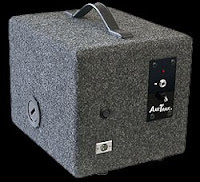 The AxeTrak® does not use digital signal processing or amp modeling to create its tone. The main components of this device are a special high-end driver designed exclusively for this application and a custom designed cardioid microphone. These components coupled with a few other proprietary analog components produce an incredibly warm tone and natural feel. This small revolutionary device provides a simple solution for any guitarist wanting to quietly record or mic their live guitar setup. Simply connect the speaker jack of your guitar amplifier to the input of the unit and from there to your mixer or recorder. The AxeTrak® does not run on batteries or need a power adapter. It is powered by the output of the amplifier. The 8-ohm input of the AxeTrak® can handle up to 75 watts RMS of overdriven power. It is also capable of recording incredible sounding clean guitar tones but at slightly lower volume levels. The XLR output connects to the impedance matching transformer if needed, and then directly to a recording console, mixing board, or computer soundcard. The audible sound radiating from AxeTrak® is that of a whisper, while the recorded sound coming from the low impedance balanced output is pure cranked tone. This device enables any guitarist to record thick rock rhythms and screaming leads anytime day or night. The neighbors will never hear a thing. 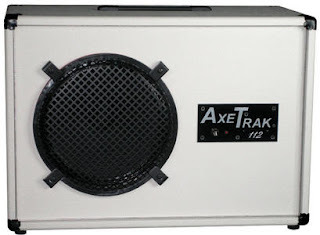 The AxeTrak® has the potential to revolutionize the way overdriven and distorted guitar tracks are recorded. For more information, visit their web site at http://www.axetrak.com/. The purpose of this article is to give you a bit of an idea how someone who doesn’t really profess to be an audio engineering whiz goes about getting their ideas down in listenable form. There are other dudes far more qualified than I to tell you the ins and outs of inputs and outputs. And believe me, if I had the financial wherewithal to employ them and their fabulous studios instead of having to do it all myself in one corner of the house, I totally would. But until the economy turns around and someone gives me a big washtub full of hundred dollar bills, this is the way I record stuff. Hopefully it can give you ideas for your own projects. First off, a disclaimer: this article isn’t about how to record as cheaply as possible, otherwise it’d be called ‘Home Recording For The Stingy Guitarist,’ or maybe ‘How I Recorded Stuff When I Was At Uni.’ If inexpensive recording is your goal, get your hands on a Mac and use Garageband and its inbuild sounds, effects and amp simulators. Rather, this article is about how to make the most of what you have. I’ve accumulated my gear over many, many years, one piece at a time. If you’re interested in buying any of the gear mentioned in this article, there are links to a lot of it at the end, and a lot of this stuff can be found pretty inexpensively in secondhand stores and on eBay. At the moment I’m using a DigiDesign Mbox Pro Factory with Pro Tools 7.4LE. Yep, I haven’t even had the chance to upgrade to Pro Tools 8 yet. I’ll get there soon, don’t worry. Just pretend this article was written a year ago if that’s a problem for ya. Though I’m a guitar geek, most of my songs start with drum ideas, which I enter either via the mouse in Pro Tools’ MIDI edit window, or by tapping out a rhythm on my inexpensive Edirol MIDI keyboard, then tightening up the performance later if I need to. For drum sounds I use Drumkit From Hell Superior by Toontrack. This program features all sorts of ninja drum kits recorded with a multi mic setup. You can turn on or off the bleed from each mic so, for instance, if you want your snare to also be heard through the overhead mics but not the kick and hat mics, it’s as easy as unchecking a box. You can send each mic/drum to a separate channel in Pro Tools and treat it accordingly with compressors, EQs, reverbs and the like. This works great for metal where you might need to really process your kick and snare, but if I’m doing rock stuff I find that I really like the completely un-effected stereo drum mix with all the room mics cranked up. Now, here’s the key to getting sequenced drums to sound more realistic, especially if you are taking the ‘draw the notes in with the mouse’ option: the MIDI velocity data for each hit. If you leave everything at exactly the same velocity, the exact same sample will be triggered each time. Not exactly great for expressive music. I’ve found that for rock stuff Drumkit From Hell’s kick, snare and tom samples tend to sound best when you use harder velocity settings in the 95-120 range, while the hats sound better if you use softer ones. I arrived at this conclusion by using my MIDI keyboard to tap out various kick/snare and hat rhythms of different velocities, recording the results so I could zero in on the good bits with my ears. Only then did I turn on the option to view the velocity settings for each hit, so I could figure out exactly why I liked the bits I liked. Now, sometimes I tap out the kick/snare part separately to the hat part, and combine them later, so I don’t get all muddled and hit the snare too soft and the hat too hard. Next up I lay down a guide rhythm guitar. The most important thing for me at this point is making sure I’m recording at just the right level: not too loud, not too quiet. If you’re in the thrall of a creative brainwave it can be easy to overlook this aspect, but DON’T! Nothing can ruin a perfect performance like a bad recording. While tracking I usually use either Amplitube 2 or Guitar Rig 3 for my amp sound. I’ve created some presets in each which give me a nice straightforward overdriven amp tone with a little bit of ambience just because it sometimes can feel a little confronting to hear your guitar totally dry through headphones or small studio monitors. A similar recording process takes place for the lead guitar, but I try to make sure that I use different guitars for the rhythm and lead parts. I find that if you layer several different parts using the same pickup some of the frequencies can get a little clouded and you have to start deciding which part to attenuate. I use mostly DiMarzio pickups and my favourite combination is the Tone Zone for rhythm and the Evolution for lead. The other way around can sound pretty good too, while multiple Tone Zone takes seem to get a bit mushy-sounding. The Blaze bridge humbucker in my main 7-string, an Ibanez UV777BK, seems to be the only pickup that seems to ‘sit right’ when I use it for both rhythm and lead. Now it’s time to add the bass. Since guitar is my main instrument I just feel I have a better idea of the state of the song if I have a rhythm guitar part down first, and since my bass idols are John Paul Jones and Geezer Butler I tend to listen to the lead guitar so I can improvise little fills around it. Most other dudes will record the bass before any rhythm guitar but that’s not how I roll. My most valuable secret for getting a good bass performance (and to make up for the chance of a sterile take caused by adding the bass after doing the guitars) is absolutely free: I stand up. I find that stomping my foot and maybe having a little bit of a boogie while playing really helps me make the rhythm more physical and impactful. Now comes the really fun bit: I decide whether I want to keep the simulated amp models or replace them with my real amp, a Marshall DSL50. I wait for a time when the family is outta the house, then send an output from the Mbox to a Radial ProRMP reamp device, which converts the signal to the right level for a guitar amp, then into my pedalboard and Marshall. 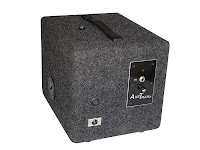 The Marshall is plugged into an AxeTrak isolated speaker cabinet, an ingenious little device which includes a small speaker and a microphone sealed inside a soundproof box. Even when the amp is cranked to where it really starts to sweat, the AxeTrak never moves beyond speaking volume. The AxeTrak’s internal mic plugs back into the Mbox and voila: instant real, miced up guitar amp recorded at my leisure. I’m always very careful to copy down the exact amp settings and include them as a note for each track in Pro Tools so I can either add more tracks with the same sound at a later date, or use that setting for a different song. And there we have it: an entire track recorded from the ground up with real amps and ‘real’ drum performances – well, as real as they can get when you’re tapping them out on a velocity-sensitive keyboard and using samples of actual drum kits – but without the cost of having to rent out a studio, set up a drum room, or scare the heck out of the neighbours with cranked up Marshall power. As I said earlier, in an ideal world I’d record in a real studio with real drums, a human rhythm section and a room full of amps to record extremely loud guitars, but until that day comes, this method works for me.